Yes, I really won a prize at my work cookie bake-off! I’ve never really won anything, so this was exciting in itself, AND the prize was a beautiful handmade glazed mixing bowl and a little whisk. I’ll post photos of that later. I highly recommend these cookies, which are adapted from Martha Stewart by way of Stephanie’s Kitchen. 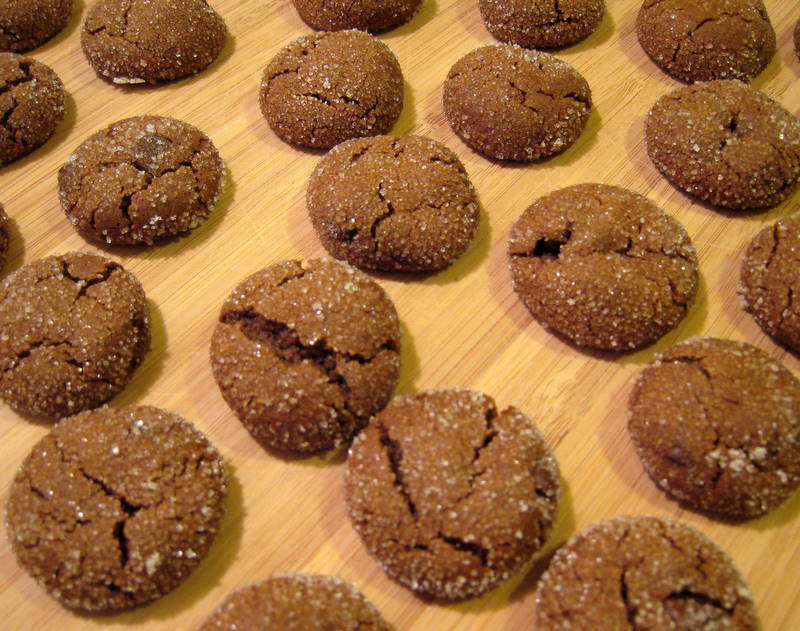 I veganized the recipe (sorry, cow butter lovers) and added lots of crystallized ginger. My version is below. 2. In a bowl, sift together flour, ground ginger, cinnamon, cloves, nutmeg and cocoa. In a large bowl, beat margarine and half of the crystallized ginger on medium speed until lightened, about minutes. Add brown sugar, beat until combined. Add molasses; beat until combined. 3. In a small bowl, dissolve baking soda in boiling water. Beat half of flour mixture into butter mixture. Beat in baking soda mixture, then remaining half of flour mixture. Mix in chocolate chips and remaining crystallized ginger; turn onto plastic wrap. Pat out to a 1 inch thickness; seal with wrap. Refrigerate until firm, 2 hours or overnight. 4. Preheat oven to 325 degrees. 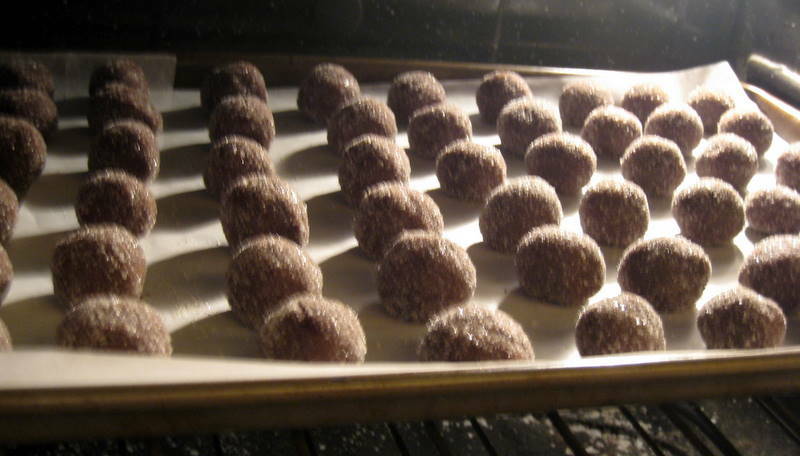 Roll dough into 1 1/2 inch balls; place 2 inches apart on prepared baking sheets. Chill 20 minutes. Roll in granulated sugar. Bake until surfaces just begin to crack, 10-12 minutes, rotating halfway through. Let cool 5 minutes. Transfer to a wire rack and cool completely. For the perfect post-yoga snack, try one of these little treats. It has bananas and natural peanut butter, so it’s super healthy. I’m eating one right now. The truth is that I hardly ever bake, it’s really only been since I found the long lost bag of self-rising flour in the cabinet. And of course, my deep and enduring commitment to participating in VeganMofo has compelled to make things that are fairly photogenic. Combine all ingredients EXCEPT flour and chocolate chips in a bowl. Blend using a hand mixer or immersion blender (my method). When well mixed, stir in flour gently. Add chocolate chips and stir in. Pour into prepared muffin pans (I use silincone, no greasing needed). Bake 20-30 minutes, until an inserted toothpick comes out clean. * Cool at least 10-15 minutes. *In the first batch, I made very large muffins and it took them about 30 minutes. For the smaller ones, I’d say check at 20 minutes. These delicious muffins are quick and easy to bake. This recipe was originally for our delicious cranberry muffins, then it evolved into plum muffins. Last night we had a dessert craving, so we tried the base recipe using cocoa powder and chocolate chips. They’re perfect for a late night snack, and smell amazing. Enjoy! Preheat oven to 325. Mix all ingredients–except chocolate chips–in a medium bowl. When well combined (you may need a little extra water) stir in chips. Scoop into a prepared muffin tin (we used silicone, so no oil needed). Bake for 22-25 minutes, until the toothpick comes out clean. Cool at least 10 minutes. Makes 9-12 muffins, depending on the size you like. Preheat oven to 350°F. 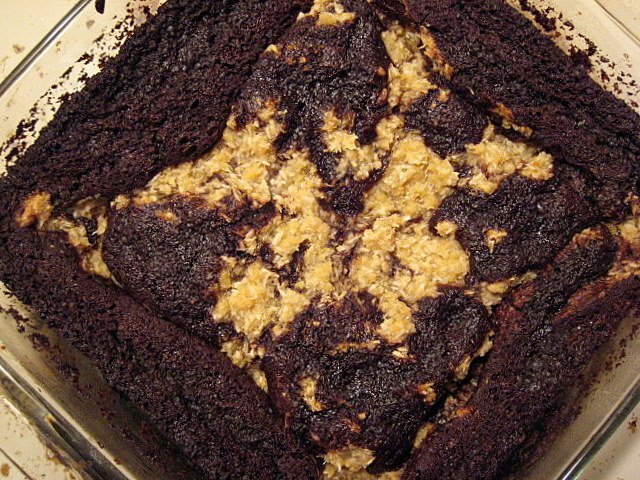 Grease with soy butter, a 9x9x2-inch baking pan. Combine sugar, butter, orange juice, and molasses in small saucepan. Bring to boil over medium heat, whisking until sugar dissolves and syrup is smooth; boil 1 minute. Pour evenly into prepared pan. Arrange pineapple pieces close together in a single layer in the syrup. Whisk flour, baking soda, baking powder, cinnamon, ginger, and salt in medium bowl. Beat butter in large bowl. Add sugar and beat to blend. Beat in egg. Beat in molasses, then pumpkin. Beat in dry ingredients just until blended, occasionally scraping down sides of bowl. Beat in 1/2 cup boiling water. Pour batter evenly into pan. Bake cake until tester inserted into center comes out clean, about 40-50 minutes. Cool cake in pan 30-45 minutes. Place platter over pan and invert. Let stand 5 minutes. Gently lift off pan. 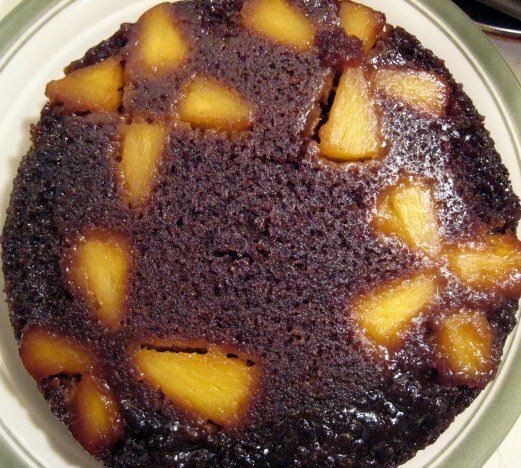 Serve cake warm or at room temperature. Heavily borrowed from Tofu for Two‘s Vanilla Custard Brownies. However, we were not paying attention to the conversions very carefully, so the texture is probably a bit different. 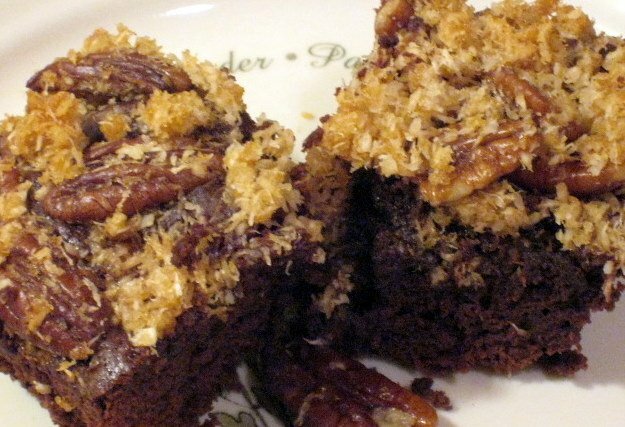 We made these yesterday for Jennifer’s birthday and they turned so rich, fudgey and delicious! Preheat oven to 350 and butter an 8 x 8 x 5 cooking dish. Mix ingredients well with a hand-mixer, then stir in coconut. Set aside. Melt chocolate and butter on the stove, with a little water. Set aside to cool. Combine dry ingredients in a bowl. Then stir in the yogurt and coconut milk. Stir well then add in the chocolate and butter. Pour into the greased baking dish. Pour the coconut and tofu mixture on top of the brownie batter. Take a knife and swirl the coconut mixture around for the marbled design. Bake for 35-45 minutes. The original recipe said to bake for 35 minutes, but ours was not yet cooked in the middle so we left it in for an additional 8-10 minutes. Thanks to Stef’s mom for the recipe! This version includes our vegan revisions. Mix together dry ingredients. Pour in milk slowly, and stir with a spoon. 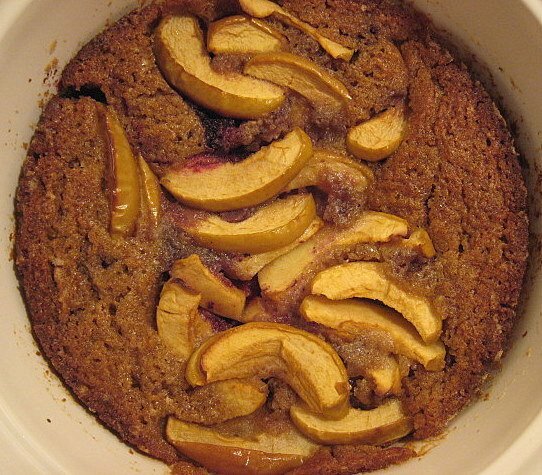 Melt margarine into a deep pyrex or corningware baking dish. Pour batter on top of the hot butter. Do not stir. Add fruit in the center of the batter. DO NOT STIR. Bake 35-40 minutes (or more) at 325 until light brown around the edges. In a 1 1/2-quart bowl stir together topping ingredients until combined well. In a 1 1/2-quart saucepan melt butter over moderately low heat. Melt in semi-sweet chocolate and stir frequently. Remove pan from heat and stir in sugar and vanilla. Add eggs, 1 at a time, beating well with a wooden spoon after each addition. Into a bowl sift together flour, cocoa powder, baking powder, and salt and stir into butter mixture until just combined well. Spread batter evenly in pan and sprinkle with topping. 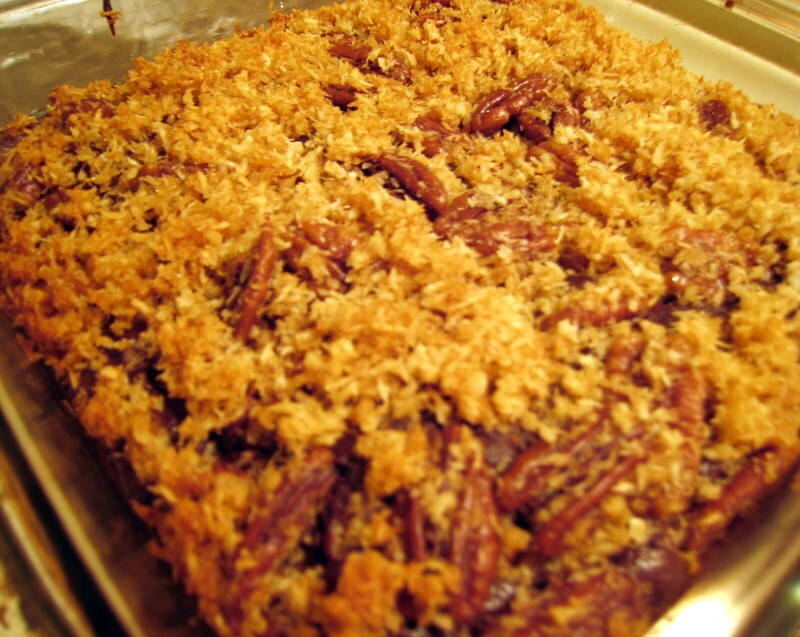 Bake brownies in middle of oven 30 to 35 minutes, or until a tester comes out with crumbs adhering to it. Cool brownies for 20 minutes or so before eating.